If you want to be an influencer one of the most effective ways is to start and maintain a blog that is filled with great content. Where many new bloggers get hung up is knowing what to write about. Most bloggers know the general category they want to write about, e.g. entrepreneurship, leadership, startups, cats, etc., but it’s the specifics that are often difficult. To be frank, I’ve never had a problem finding ideas for blog posts. Here are the methods I use to find inspiration. What am I doing right now, with this very blog post? I’m answering a question asked by a reader, Brady Enman. I could answer his email, but if I’m going to type up a big email response why not turn it into a blog post? 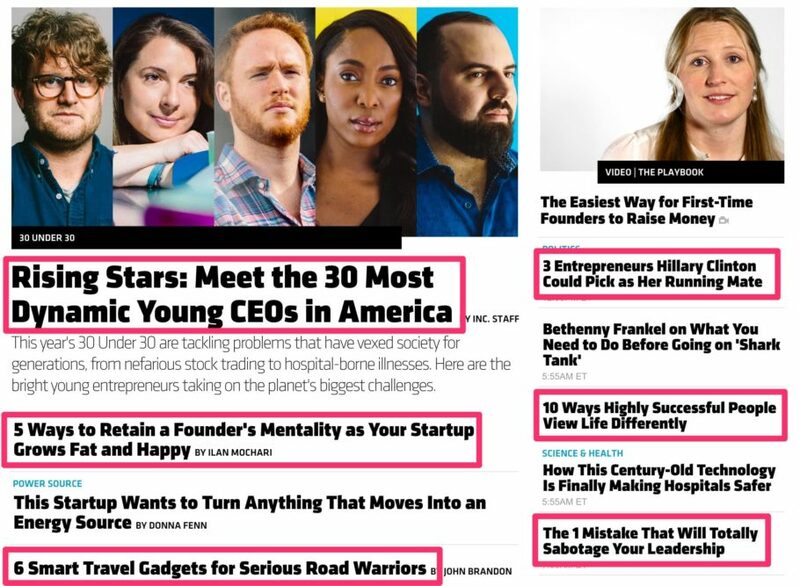 More on this in How To Create Content Marketing Success From Old Emails. Do you see the same questions coming up over and over in your blog comments? Respond to those questions with blog posts as answers. People are asking lots of questions on the question and answer website Quora. Why not check out some of the most popular questions from your category of choice and answer them? That’s what I did. 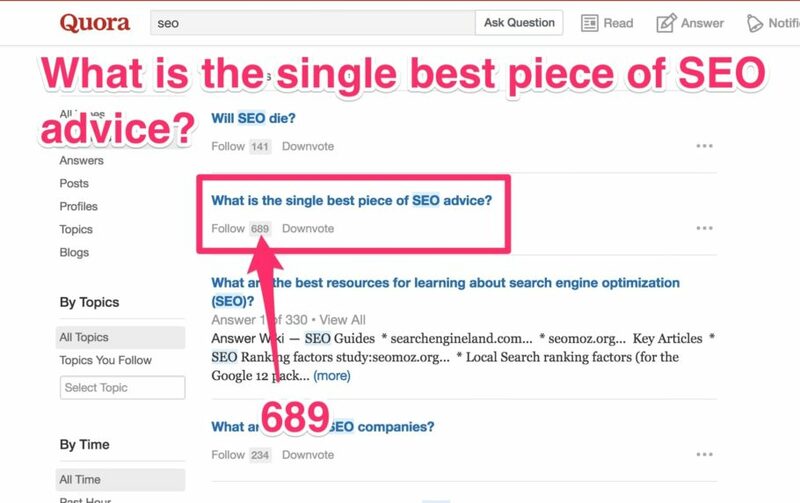 I went and searched for “SEO” and found that the most popular question on this topic is “What is the single best piece of SEO advice?” I recently created a piece of content answering this question, which will soon be published in a major online publication. Reddit is a discussion forum and many questions are being asked and answered. You can see which questions or discussion topics from your area of expertise draw a lot of interest and then come up with a list of blog post ideas. 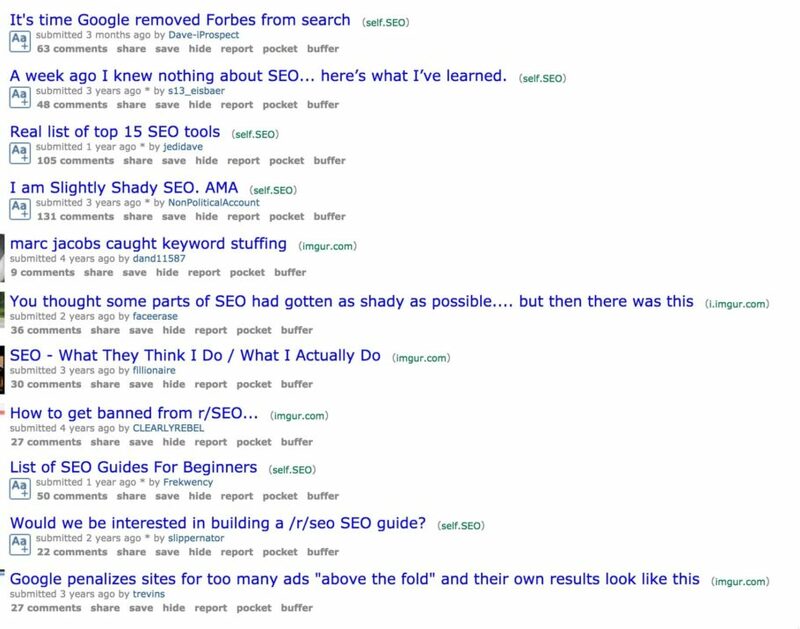 Below are some of the top topics of all time from the r/SEO subreddit. I can get at least one idea for a blog post from each one of these discussions, and in some cases I can think of multiple blog posts. Are you selling something? How do your customers use your product or service? Is there a correct way and an incorrect way to use it? Can you write a guide on how to use it? Can you write a guide about how to buy your product or service? I wrote 4 Tips For Hiring The Right SEO Firm for Forbes a few years ago. I didn’t intend to get any leads from it but boy howdy has my agency ever gotten leads off of that post. Do you have a blog post up that explains how to make the right choices when it comes to buying what you sell? If not, put that on your to-do list to write today. Have you ever read a blog post and thought “Wow, I wish I had written this.” Well, what’s keeping you from writing it? I don’t mean copy the blog post, I mean copy the success of that blog post. Write the same blog post, but in your own words, with your own experiences and stories. You can write it from a unique point of view all your own. Who cares if 50 other people have written similar blog posts? Yours can still be unique, and many of the people who find your blog post won’t ever know the other 50 exist anyway. You should write a blog post about how your product will help people lose weight and get rich (see Every Successful Business Blog Post Does This). “But I run a self storage facility,” you say? Doesn’t matter. Write a blog post about how self storage will help customers lose weight and get rich. Trust me, even if it’s purely humorous it will get read and people will love it. What’s your problem? What do you struggle with? Write about it, and how to overcome it. Are there books that focus on your industry or topic of interest? Write blog posts that are reviews of those books. Create a book review section on your blog. BuzzFeed knows that people like lists. So does Inc magazine and many others. See? Got a blog post that is doing really well? Go deep and expand on that topic. If you’re not sure which posts are doing well, check analytics. Follow the news and trends in your industry. When something is happening, jump on it and write a blog post quick to take advantage of the news cycle. If you write down your ideas, it tells your brain that it’s safe to come up with more ideas and they won’t be ignored, and you’ll find your brain giving you more and more ideas. What are you afraid to write about? What are people in your industry afraid to write about? Write about it. If nobody in your industry shares pricing, share yours, and write about why everybody else is scared to write about it. Did you just go through an interesting experience and learn something you think others would benefit from? Share that story and explain how it helped you. People invest in infographics because they’re popular topics. They’ve already curated ideas. Write a blog post based on what you see in an infographic and hey, why not include the infographic in your blog post and then tag that creator on Twitter? Maybe they’ll retweet your post. 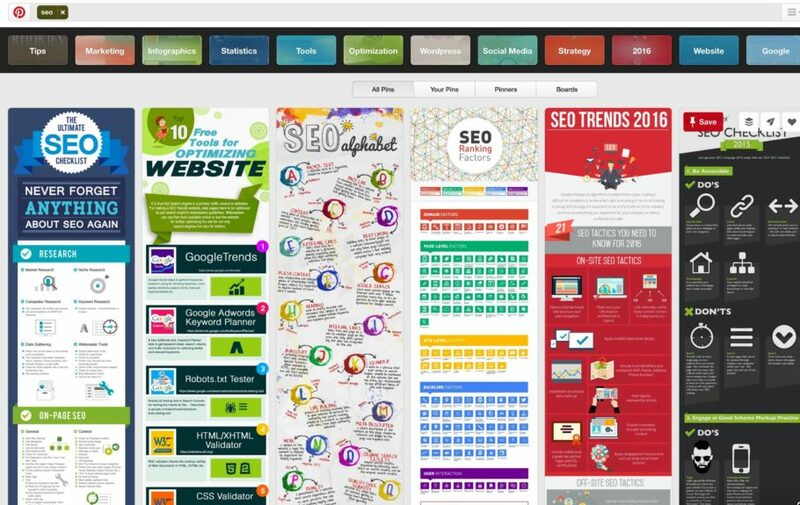 Did you know Google keeps track of what’s getting popular on their search engine? It’s called Google Trends and it’s a goldmine for ideas. What’s everyone else in your industry writing about? Do a roundup. For example, I could do a blog post called “The 10 most interesting SEO articles of May, 2016” and write a summary of each one and the link to it. People love to be interviewed. Go interview an expert in your field or industry. Interview a co-worker. Interview the CEO of your company. Then post the transcript of the interview, some quotes, or write an article based on the interview. Are there certain tools or software that are used in your industry? Write about those tools. Go to an industry event and write about it. Bonus idea: Write a blog post entitled “Top 25 People to Meet at Amazing Event 2016” and then tweet the article out to those 25 people. Chances are you’ll get to meet a lot of those people when you attend the event. Then you can interview them and get more blog posts. Is there research being done in your industry? Blog about what the research is saying. Turn it into layman’s terms anyone can understand. People will thank you for it by sharing the content. HARO is a service that connects journalists with sources. You sign up (for free) and then receive 3 emails per day, each of which may include 50 requests from journalists saying “I’m writing a story about such and such and I need a quote from an expert on this topic…” You can respond to a request if you think you can contribute, or you can look at the articles being written and use those as inspiration for creating blog posts. More on this at How To Use HARO For Content Marketing Ideas. Do you have any methods for coming up with blog ideas I didn’t cover? Let us know in the comments below. Not Sure How To Start Blogging? Try This. Want to grow your influence by writing? Subscribe to my newsletter to get helpful tips on writing blog posts, articles, ebook, books, and more.